Co+Co by Coco Rocha will accompany the relaunch of her website into a "lifestyle network." Coco Rocha is expanding her empire. 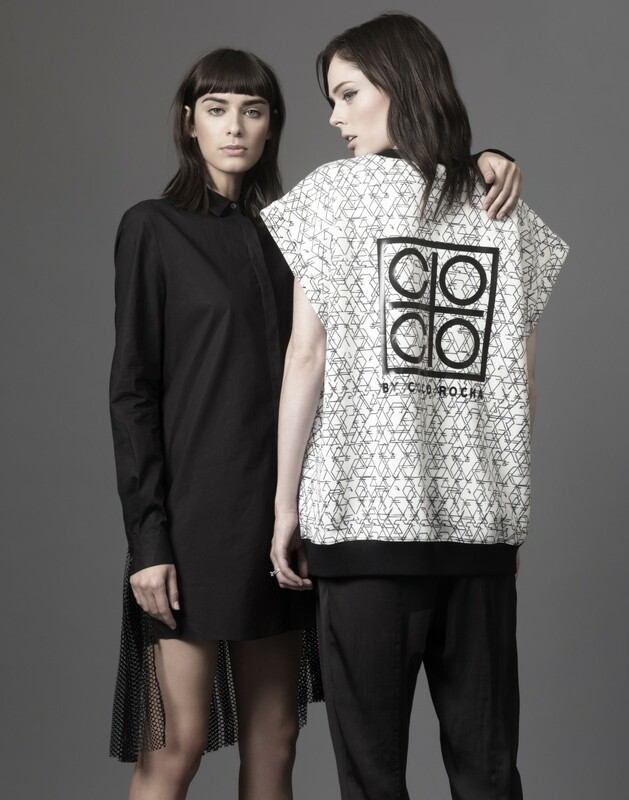 On Thursday, Paragon Project, a Los Angeles-based fashion collective, announced the launch of Co+Co by Coco Rocha. The Canadian model will serve as a designer and ambassador for the brand, which is launching with a 60-piece, architecturally inspired collection of contemporary sportswear — more "streetwear" than "athleisure" — priced between $80 and $300. Her husband, artist James Conran, is also on board, serving as a creative collaborator alongside Paragon Project. Co+Co will be sold on Rocha&apos;s website, which will relaunch as a "lifestyle network" by late January, as well as U.S. and international retailers (no word yet on which ones). "I&apos;m all about quality, materials and construction. Being raised around fashion since I was 14, I&apos;ve seen first-hand what makes beautiful tailoring and what makes for something that will literally fall apart on you after a few hours," Rocha told Fashionista. "I think when it comes to streetwear with an athletic edge, it&apos;s either super cheap and poorly made or it&apos;s ridiculously expensive and out of the reach [for] the everyday woman." She described Co+Co&apos;s aesthetic as "clean and sophisticated" with pieces made from scuba materials and featuring details like tape-sealed seams. Although Rocha has embarked on plenty of collaborations throughout her 13-year career (most recently with handbag brand Botkier), she&apos;s waited longer than some of her peers to do her own line, perhaps out of a desire to be taken seriously. "It&apos;s a constant battle to fight against the stereotype that models are meant to just glorify clothing hangers, and sit there while looking pretty," said Rocha. "Having been around the most amazing creatives in the industry for more than a decade, how could I not be inspired myself? And being married to an artist, we&apos;ve wanted to design our own line for quite a while now. ... When I first met with Paragon a year ago we were all on the same page that it would be a true partnership in every sense of the word, not just me lending my name to something. From design to presentation, even the logo and hang tags, we are loving putting a real DNA into this brand." Rocha will surely be hands-on when it comes to digitally marketing her new label, too. Boasting over 2.25 million followers on Instagram and Twitter combined (not to mention her sizable Snapchat and Tumblr audiences), Rocha is well-considered a social media maven. (Even her eight-month-old daughter&apos;s Instagram account has nearly 48,000 followers.) And with a website revamp in the works, Rocha&apos;s followers will undoubtedly be seeing a lot of Co+Co content on their social feeds very soon. This post has been updated to describe the brand&apos;s category as streetwear instead of athleisure clothing, along with additional quotes from Rocha. We chatted with the model-turned-designer about the fashion tips from industry friends that helped her create Co+Co by Coco Rocha. Coco Rocha is a woman with many talents: She's a super star model (duh), talented Irish dancer, one-time TV host and now, a bonafide jewelry designer. Seriously, is there anything she can't do (and look good while doing it)? Rocha's new jewelry line is called Coco Rocha for Senhoa. The line, in addition to being pretty darn lust-worthy, also benefits Senhoa, an organization dedicated to helping Cambodian victims of human trafficking, WWD is reporting. Rocha's own celever tagline for the line? "Accessorize Your Conscience."